HD KVM over IP: The Union of AV and IT Gets Real. 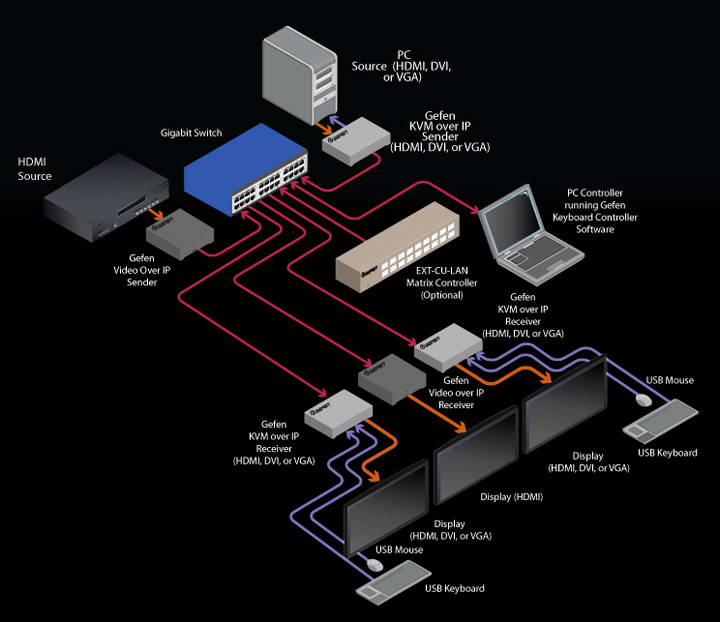 Gefen’s HD KVM over IP uses a Local Area Network with a gigabit switch to provide flexible, scalable access to computers in network-based environments. It utilizes Internet Protocol technology to extend workstations anywhere on the LAN. Typically a KVM (keyboard, video monitor and mouse) are connected directly to a computer or laptop. By connecting KVM through Gefen’s HD KVM over IP extender, you can access your KVM workstation from anywhere on LAN. By tapping into Video over IP technology, Gefen expands its KVM solutions—the cornerstone of its product line—to a new audience of IT professionals. Professionals can benefit from the HD KVM over IP system because it provides the building blocks to create a virtual matrix that can support up to 256 sender and 256 receiver units on the same LAN. It can create virtually infinite workstation management scenarios for any system using an existing LAN. With support for high definition video in the HDMI format, HDCP-compliance and an extension distance of 100 meters on both sender and receiver sides, this solution provides one of the most advantageous methods of integrating and distributing high definition video today. USB 2.0 peripherals, RS-232 control signals and bi-directional IR are all sent over the LAN using the same CAT-5 cable as HDMI audio and video. Typical KVM extenders need their own dedicated cabling for added peripherals, requiring large wiring infrastructures apart from the existing wiring used by the LAN. With the HD KVM over IP solution from Gefen, you can use the existing LAN, eliminating the need for costly rewiring of new CAT-5 cables. This can be great for accessing remote servers right from the desktop, or even when relocating workstations to reduce heat exposure or electromagnetic interference. Users can gain remote access to server rooms, terminals, shipping/receiving workstations, security stations, hospital room data entry stations and more. Gefen provides two additional models, supporting DVI and VGA formats, which can be integrated seamlessly with the HD KVM over IP on the same network. Not only will these extend KVM signals, but they will also extend USB 2.0 devices, two-way analog audio, RS-232, and IR for total workstation control. Video formats such as VGA, DVI and HDMI can all be interchanged among various sender and receiver units over the same network, allowing an easy method of multi-format system integration. When additional sender and receiver units are connected, each can be configured to a unique IP address to facilitate cross-point routing via the LAN. When combining multiple receivers and senders, a virtual digital matrix can be created with the ability to support, in theory, up to 256 senders and receivers, provided users have the correct bandwidth and number of ports on their network switch. Ideal for highly demanding facilities such as post-production, broadcast, telecommunications and government, Gefen’s HD KVM over IP can help improve performance, increase productivity and streamline equipment. Gefen elevates system performance by making connectivity and signal management seamless. With a heritage of practical innovation, Gefen provides timely and intuitive connectivity products and solutions that bridge the gaps between rapidly advancing technology and real-world applications. We reinforce our commitment to high quality, problem-solving products with dedicated service and support, backed by the resources of the Nortek family of companies. By solving real problems with intuitive connectivity, Gefen helps maximize the value of integrated systems.